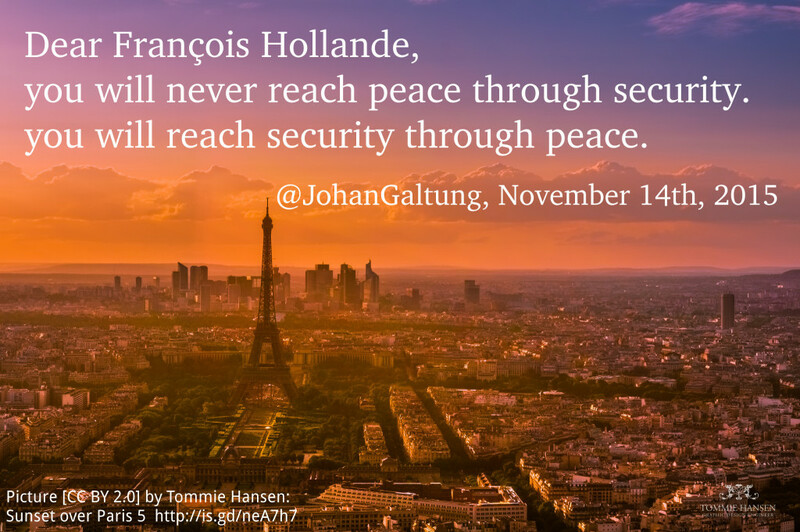 TRANSCEND MEDIA SERVICE » Violence In and By Paris: Any Way Out? In law an illegal act is detached from its context, including history; in reality the context matters more and finds its willing executioners. Kill one, Belgian or not, related to ISIS or not, and the shadows of history will mobilize and hide dozens of others. And then that whole badly constructed intellectual edifice collapses because non-Western victims have reached the tipping point, cannot take it any longer, and fall down on the violent side. And the West counts its victims–publishes their names and the perpetrators’ while keeping both anonymous when the West does the killing–stupidly concludes that what is needed is not less, but more violence. For individual and general prevention to work. Imagine West and Islam focusing not on the worst, like Western violence for prevention and Islamic for retribution, but on the best. Like the capacity for innovation and freedom in the West, togetherness and sharing in Islam. Imagine them dialoguing publicly at a high level “how can we learn from each other”? How to get more diversity into Islam, more freedom for different interpretations? How to bring more togetherness into the West to overcome loneliness, and more sharing–of wealth, knowledge, any resource–to overcome inequality–both anomalies being rampant? How can we reconcile the Islamic utopia of a world ummah, the community of the believers, dotted with countless local authorities based on the mosque and the shariah court, with the Western utopia of a world government, dominated by the West? Morale: start working. Do not waste time on stupid violence-war. Anticopyright: Editorials and articles originated on TMS may be freely reprinted, disseminated, translated and used as background material, provided an acknowledgement and link to the source, TMS: Violence In and By Paris: Any Way Out?, is included. Thank you. Thanks for your courage and for your idealism and kindness. Your voice is so needed these days. Dear Galtung. Thanks for raising your voice. It is more needed than ever. The basic problem with fanatic ISLAM is that they want the whole world to become MUSLIM, including you Galtung! They use every method they can including bombing, suicide bombers and knife stabbing to reach their religious and political goal, as they did in Paris, in Lebanon, in Russia, in Bali, and so many other places in the world! Galtung, instead of attacking Paris and the free world, attack the savagery of the ISLAMIC STATE, and of the basic doctrine of Islam to convert by all means, the whole population of our global village to the Muslim faith under one Muslim ruler the Caliphate! Be realistic Galtung and admit the truth. Don’t destroy the free world with your irresponsible analysis- save it from destruction! I am so sorry and disappointed to see how much you have changed, since we met at Queens University in Australia, and you praised me for founding IFLAC. How is he hating the west randomly? Come on dear INTERNATIONAL FORUM FOR THE CULTURE OF PEACE try again. And try harder. Thank you for the article Johan Galtung. It’s so refreshing to see something that doesn’t just involve violence and jingoism. I’ve followed the Norwegian media fairly closely now, and it’s pretty sad reading up here too. So when NRK had a feedback form I took the chance to point out I’d like them to focus more on Why (Hvorfor) and less running of errands for jingoist politicians and military people. Thank you so much Johan Galtung. Professor Aharoni is shocked by the brutality of the latest “Daesch”-organized or -inspired actions against innocent civlians. Who isn’t. Attacking ISIL or ISIS or Daesch with guns and bombs will not solve the problem. Surely Professor Aharoni sees this. Rounding up Muslim people will not solve the problem. Suspending constitutional rights in France will not help. Act defensively. Protect the best you can the vulnerable minorities and the French territory. Seek peace through dialogue in Syria and Iraq and Afghanistan. Suspend your search for strategic gain. Stop supporting one faction or the other. Seek dialogue. Listen to all parties. No exclusions. Understand. Propose (don’t impose) possible solutions.